Today was a calm May Day, for nothing too troubling happened here in the Emerald City of Seattle (or so I heard). There were many small marches throughout the day, and no riots. But, I did happen to observe heavily some evening happenings in the Westlake Center Park of Downtown Seattle. Some pro-Trump supporters arrived and verbally clashed with anti-Trump supporters. Also among them, the usual anti-capitalists, religious promoters, climate-change activists, self-made superheroes, anti-war groups (some were war vets, I was told), anarchists, and curious tourists. From a close distance and ready, were many armored police officers standing around with batons in hand. 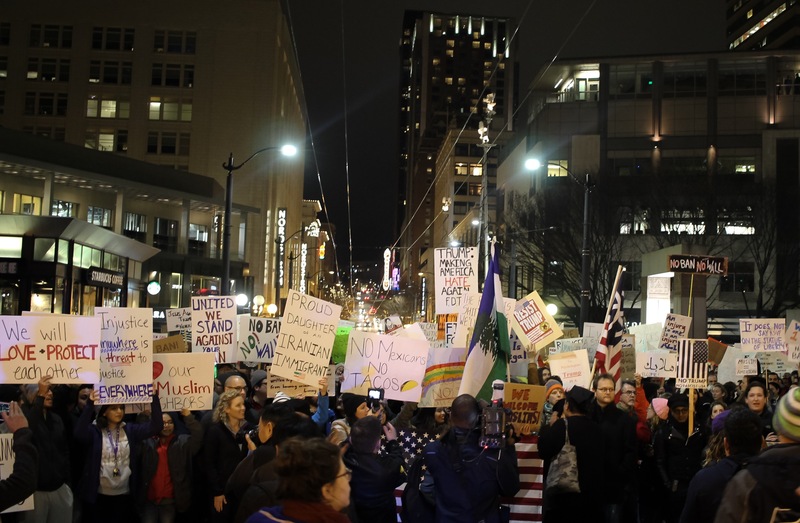 But, most of the local attention circulated around the various tense confrontations between the pro- and anti- Trump groups. Though I heard much childish banter and expletives being thrown about, there was some intelligent talking and debate that occurred. Such civility was strangely refreshing. If we all can’t along, then lets at least talk.